Léon Augustin Lhermitte (1844–1925), Claude Bernard and His Pupils (1889), copy of original by unknown artist, oil on canvas, 86.5 x 112.5 cm, Wellcome Library no. 45530i, London. Courtesy of Wellcome Images, via Wikimedia Commons. Among the many wonderful paintings in the Musée d’Orsay, in Paris, is a large canvas showing a sprawling group of farmworkers being paid for their labour during the harvest. For many, this is the only work by Léon Augustin Lhermitte (1844–1925) which they will ever see. There are also several fine rustic scenes of his in American collections. Very few get to see either of his most radical paintings: one is tucked away in the Sorbonne, and the other is now only known from copies and prints. Those two paintings are so important that they should change the way that we think about painting in the late nineteenth century. Lhermitte was a precocious artist. His talents were recognised when he was still a child, and he was educated at a special school which went on to become the École nationale supérieure des arts décoratifs. After that, he studied at the École des beaux-arts in Paris. He established his reputation at the Salon in 1864, although I have been unable to locate any suitable images of his work from the 1860s. Léon Augustin Lhermitte (1844–1925), The Cider Jug (1874), charcoal on laid paper, 40.5 x 55.5 cm, Metropolitan Museum of Art, New York, NY. Wikimedia Commons. The persistent thread through most of Lhermitte’s work is the plight of the rural poor. 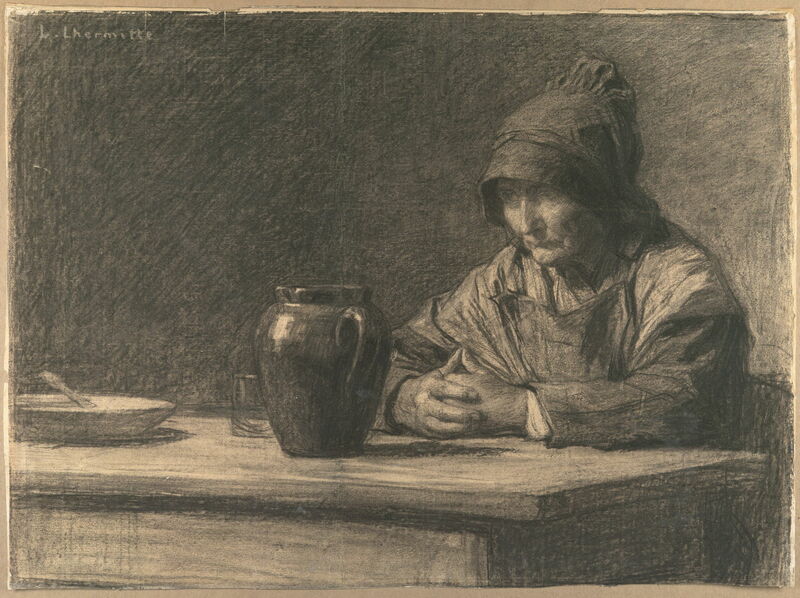 In his charcoal drawing of The Cider Jug from 1874, an older woman stares at a jug of cider. Her bowl and glass are empty, and she has fallen back on drinking home-made cider to relieve her hunger and misery. Léon Augustin Lhermitte (1844–1925), Apple Market, Landerneau, Brittany (c 1878), oil on canvas, 85.7 × 120 cm, Philadelphia Museum of Art, Philadelphia, PA. Wikimedia Commons. 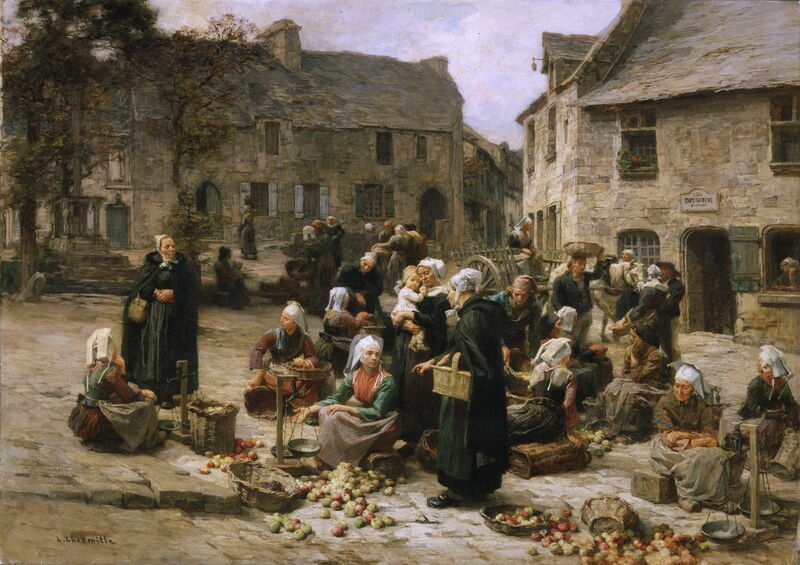 Lhermitte’s detailed realist style brought scenes such as this Apple Market, Landerneau, Brittany (c 1878) to life. With a cart on the move in the background, and sellers ready with their scales, it shows the small-scale bustle of an otherwise quiet country town. Léon Augustin Lhermitte (1844–1925), Procession near Ploumanac’h (1879), oil on canvas, dimensions not known, Private collection. Wikimedia Commons. 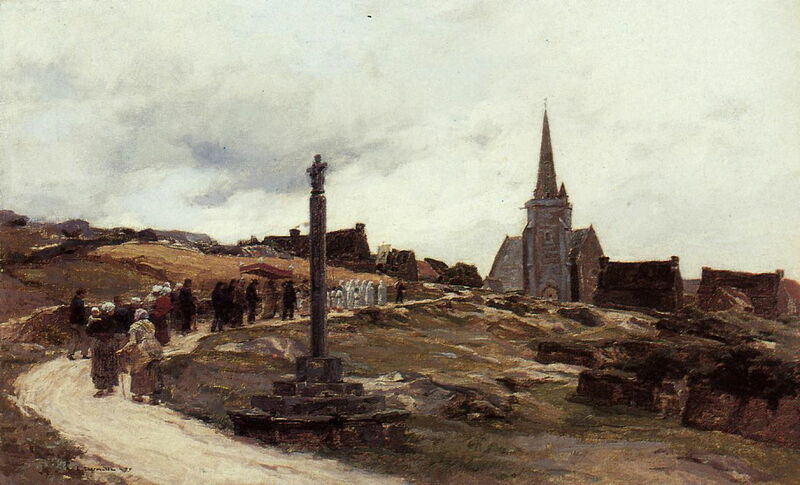 Also painted in Brittany, Lhermitte’s sketchy Procession near Ploumanac’h (1879) shows a religious festival, with a small stream of locals making their way along a track on the open hillside towards the church. Behind its leader are women and children dressed in white, the priest in front of the Host under its canopy, then mothers carrying infants, and the elderly. 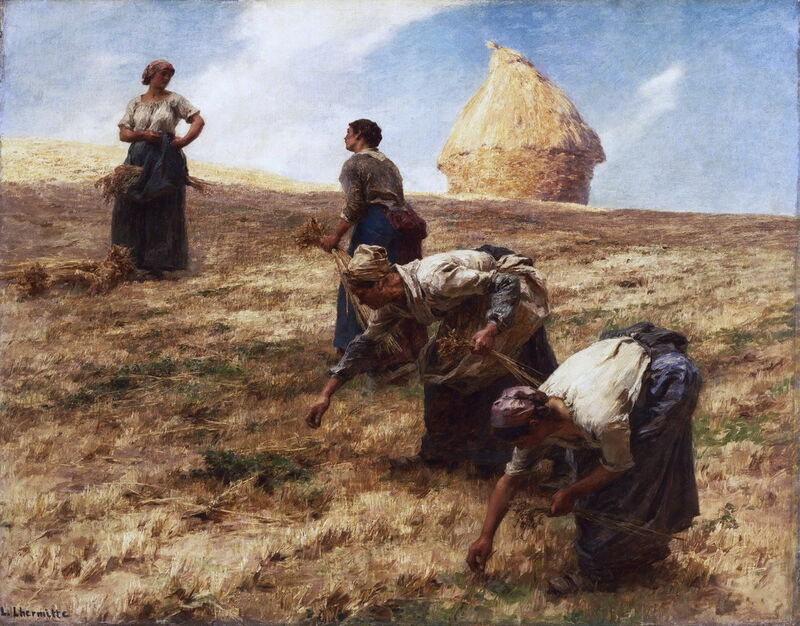 Léon Augustin Lhermitte (1844–1925), The Harvesters’ Pay (1882), oil on canvas, 215 x 272 cm, Musée d’Orsay, Paris. Wikimedia Commons. The Musée d’Orsay’s best-known painting by Lhermitte, The Harvesters’ Pay (1882), is an unusual take on the harvest. Although there are a couple of cut sheaves of wheat at the lower right, it looks at the economic and social aspects. Four of the harvesters, bearing their heavy-duty scythes, await payment by the farmer’s factor, who holds a bag of coins for the purpose. In the centre of the painting, one of the workers is counting out his pay in front of his wife, who is feeding a young infant at her breast. To their left, another worker just sits and stares blankly into the distance, dead-beat tired and wondering whether his pittance was worth all that effort. Life was hard. 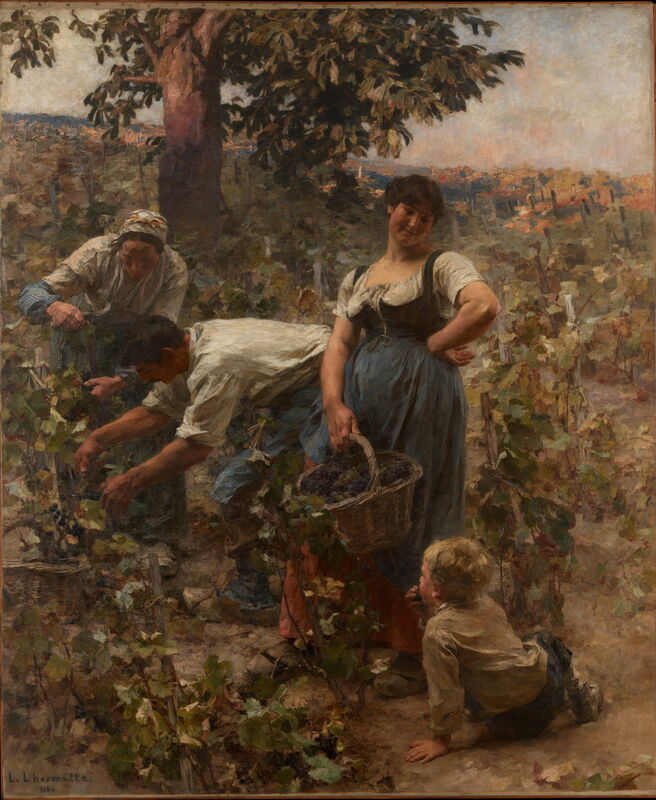 Léon Augustin Lhermitte (1844–1925), The Grape Harvest (1884), oil on canvas, 251.5 x 209.9 cm, Metropolitan Museum of Art, New York, NY. Wikimedia Commons. Lhermitte’s countryside wasn’t all bad, though. In The Grape Harvest (1884) there’s the lifting smile of a mother as she watches her young boy eating the grapes. Behind and to the left, though, the work of the harvest goes on, and looks particularly back-breaking. The painstakingly realist rendering of the vine leaves here lends this painting a unique texture. Léon Augustin Lhermitte (1844–1925), The Haymakers (1887), oil on canvas, 216 x 264 cm, Van Gogh Museum, Amsterdam, The Netherlands. Wikimedia Commons. 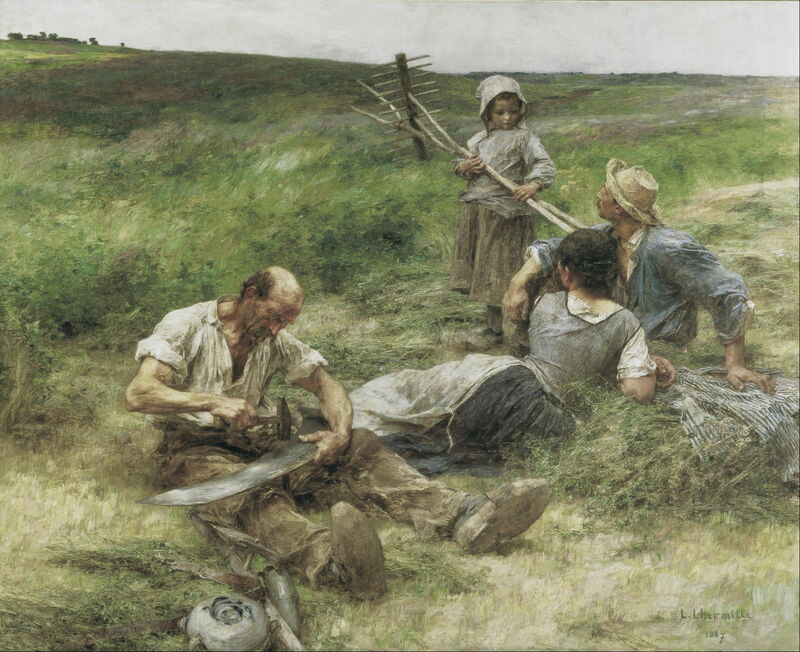 The Haymakers (1887) continues a more relaxed rustic theme, perhaps picking up the traces following Jule Bastien-Lapage’s untimely death at the end of 1884. A team of haymakers are taking a short break, as the scythe undergoes repair. * This is the opportunity for a little girl to grab the other tools, as her parents enjoy some time together. Léon Augustin Lhermitte (1844–1925), Gleaners (1887), oil on canvas, dimensions not known, Philadelphia Museum of Art, Philadelphia, PA. Wikimedia Commons. 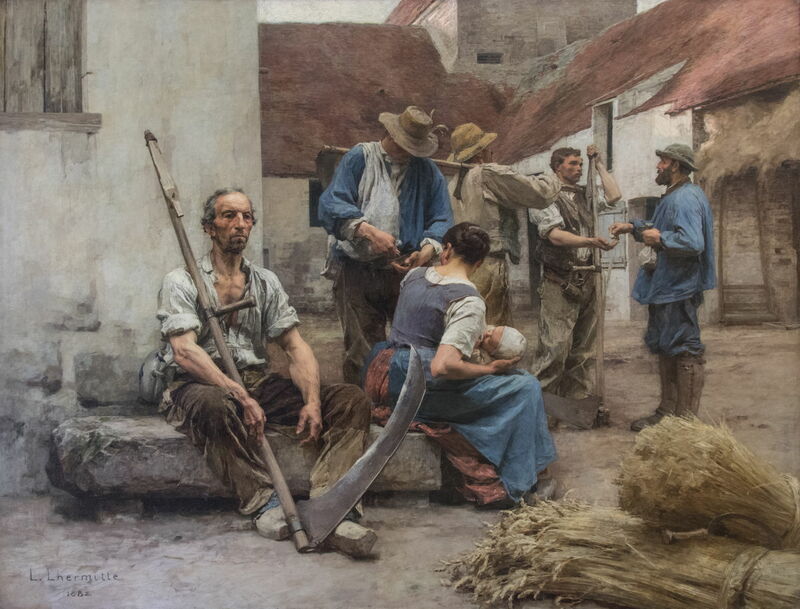 As with Breton and Millet before him, Lhermitte’s most enduring expression of rural poverty was in showing those too poor to afford their own grain purchases, and forced to salvage remains left in the fields after the harvest: the Gleaners, here his version of 1887. Lhermitte was a close friend of Émile Zola, the Naturalist novelist, and was an enthusiastic supporter of his concept of ‘experimental’ art. Unlike Impressionism, which lacked any coherent theoretical basis, Naturalism was rooted in the Positivist philosophy of the day, expounded by the likes of Hippolyte Taine and Zola, and linked to more general changes occurring in science and technology. One of the leading scientists and thinkers of the time was the French physiologist Claude Bernard (1813-1878), whose books were read avidly by Zola and many Naturalist artists. It may seem strange that non-scientists should read a book like Bernard’s Introduction to the Study of Experimental Medicine (1865), but in it Bernard expressed his views on much more than just physiology. Following Bernard’s death, the Sorbonne (where he had taught) commissioned Lhermitte to paint his portrait in 1886. Sadly I have been unable to trace an image of the original, but Claude Bernard and His Pupils is quite a faithful copy of that original which Lhermitte exhibited at the Salon in 1889. Bernard stressed the importance of not just observational science, but the experimental too, which inspired the Naturalists to pursue in the arts what they saw as the experimental approach. Zola observed people in life, filling notebooks with his observations of them. He then set characters up in the scenario for a novel, and they behaved according to his observations. He then documented this imaginary experiment, which became his next novel. 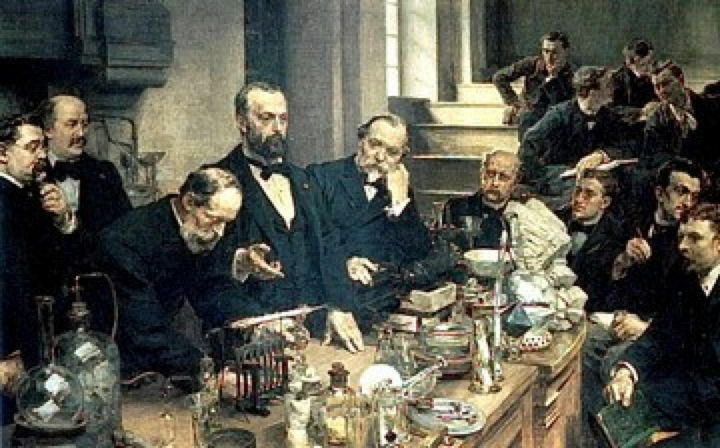 Lhermitte’s painting shows Bernard in the midst of performing an experiment on a rabbit, his students discussing its results, and one writing the experimental observations in the laboratory daybook. This carefully-chosen composition is the single most explicit link between Bernard’s science and Naturalism in art. As such, it explains how much of the Naturalist painting, between about 1880 (some earlier) and the early twentieth century, came about. Léon Augustin Lhermitte (1844–1925), The Chemist Henri Sainte Claire Deville, Lesson on Aluminium (1890), The Sorbonne, Paris. Wikimedia Commons. Lhermitte’s explanations for Naturalism go beyond even that. 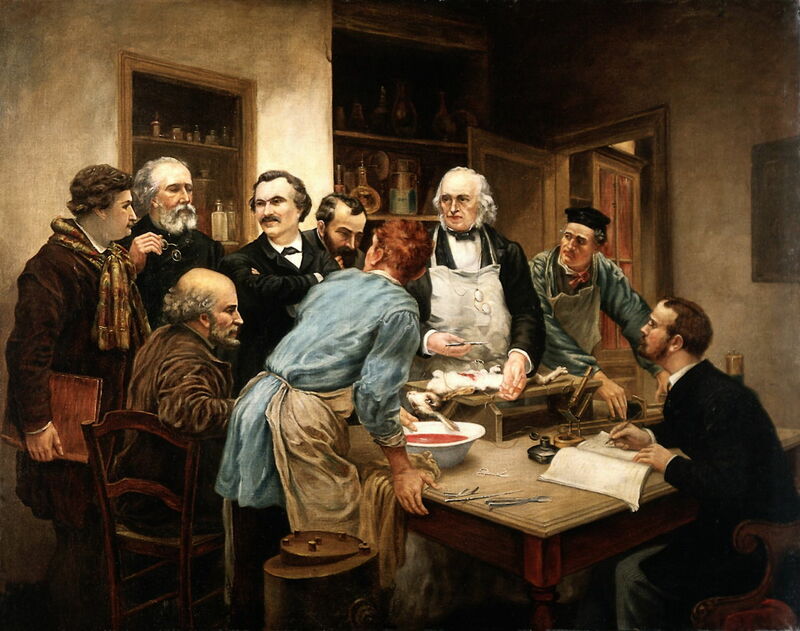 His painting of The Chemist Henri-Étienne Sainte-Claire Deville, Lesson on Aluminium from the following year, also commissioned by the Sorbonne in Paris, links the movement with science and technology more generally. I apologise for the poor size and quality of this image, which is the only one that I have been able to locate. Henri-Étienne Sainte-Claire Deville (1818-1881) was responsible for many significant discoveries in chemistry, the most important of which was a method for the industrial manufacture of aluminium. He is shown here surrounded by objects made from this new material, which quickly came to transform manufacturing, and to invade every home. * I am very grateful to David, who tells me that the worker apparently hitting the blade of his scythe with his hammer is in fact most probably sharpening it. He has seen this performed in recent years in Cantabria, Northern Spain: the technique involves hitting the blade against a metal post, which can just be seen in this painting, so beating the wrought iron blade into sharpness, and giving it a slightly ragged edge. It seems to be a common midday task among those using traditional scythes. Posted in General, Life, Painting and tagged Bastien-Lepage, Bernard, Breton, Lhermitte, Millet, naturalism, painting, realism, sciences, Zola. Bookmark the permalink.